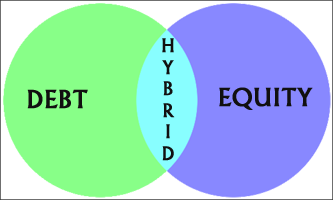 Hybrid Funds means funds made by combining two or different category of assets equity and debt. As hybrid fund invest in two asset categories investor can avail the benefit of both. Hybrid Fund offers maximum diversification and moderate returns. A hybrid fund is a combo of equity and debt. There are various types of hybrid funds available to Indian stock market investors. The decision of investing in hybrid mutual funds depends upon investors risk profile and investment objective. Prior to recategorization Hybrid fund was known as a balanced fund. The hybrid fund works on the balanced approach of investing. The fund manager of fund invests your money in the stock market (equity) and fixed income (debt) in varying proportions based on fund investment objective. If it is equity-oriented fund exposure to equity will be more and if it is debt-oriented fund exposure to debt will be higher. The equity component of the hybrid fund includes equity shares of companies across sectors like FMCG, finance, healthcare, real estate, automobile, capital goods etc. The debt component of the hybrid fund includes fixed income instruments like fixed deposit, government securities, bonds, debentures, treasury bills etc. The fund manager takes buying and selling decision-based on the market conditions. There are six types of hybrid funds. Details of each fund is given below. Conservative fund as the name indicates it is made for conservative investors with low-risk appetite. These funds invest mostly in debt instruments. Fund objective is to invest around 70-90% money in debt and remaining in equity. These funds were earlier known as MIPs. Balanced funds have similar attributes as its name. This fund invests in both equity and debt in nearly equal (balanced) proportion. Fund objective is to invest 40-60% in equity-related instruments and remaining in debt. These funds are suitable for investors with a moderate risk profile. Aggressive Hybrid Fund has aggressive investment strategy and higher exposure to equity and equity related instrument. The objective of this fund is to invest 65-80% in equity related instrument and remaining in debt instruments. These funds are suitable for aggressive investors. Dynamic Asset Allocation fund as name indicates asset allocation in this fund is dynamic. It can take extreme exposure to either equity or debt based on market condition. Asset allocation ratio in this fund is decided by formula. These funds are suitable for the investor who prefers less volatility in returns. Multi-Asset Allocation fund invests in multiple asset class or at least 3 asset class with 10% exposure to each. The asset types include equity, debt, commodity, real estate etc. These types of fund reduce the risk as portfolio is diversified. Arbitrage fund is a type of mutual fund that takes advantage of the differences in the price of securities in the cash and derivatives market to generate a return. The arbitrage fund makes money from low risk buy and sell opportunities available in cash and future market. This fund is suitable for low-risk investors. Hybrid funds are comparatively safer bets than pure equity funds. These funds provide higher return compared to debt fund. This fund is suggested for conservative investors with moderate risk appetite looking for income generation or capital appreciation. The equity component of fund offers the probability of higher return, at the same time, the debt component offers a cushion against market conditions. As there are multiple types of hybrid funds available in the market, as an investor you must be careful in the selection of the right hybrid fund. If you are a conservative investor go for conservative hybrid funds or Arbitrage fund. If your risk-taking capacity is higher you can go for aggressive hybrid funds. One should consider following points while investing in Hybrid Funds. Risk – A Hybrid fund is not completely risk-free. It is less risky compared to equity fund as debt component is involved. Return – Hybrid funds do not offer guaranteed returns. The returns entirely depend on market condition and performance of underlying assets. Expense Ratio – Expense ratio is one of the important factors while making a decision of buying a mutual fund. You should select a fund with a lower expense ratio. Investment Horizon – A Hybrid fund is ideal for medium-term investment horizon. The recommended investment horizon for a hybrid fund is 5 years. Tax on Gain – Long-term capital gain tax and short-term capital gain tax both are applicable to mutual funds. If you are aggressive investor you can invest your money in aggressive hybrid funds. 3 Best Aggressive Hybrid schemes are given below. I hope details given above will help you in selecting hybrid mutual fund for investment. Do share your queries and feedback in the comment section given below. « How to Invest in USA stock market from India?